Indian Country Today reporter Vincent Schilling was drawn in by a German museum's efforts to identify a man sporting a Native American headdress in a poster from the 1970s. It took Vincent Schilling just a few hours to crack the case of the unidentified Lakota man. The Indian Country Today associate editor was drawn in by a German museum's efforts to identify a man sporting a Native American headdress in a poster from the 1970s. "Does anybody know who this is? We are looking for his name," reads a Facebook post on March 4 from the Weltkulturen Museum in Frankfurt. "All we know is that he must be Lakota." It was part of the museum's attempt to identify and gather information about the people whose images are featured an upcoming exhibit about Indigenous life in North America, organized by Goethe University students. "I was very happy to see them, you know, reaching out to want to give a name to a respected elder who deserves not to just be stereotyped as a Native American," Schilling told As It Happens guest host Helen Mann. "The fact that someone's asking to name him shows, you know, a respect for the culture, which is very encouraging." Immediately, Schilling — a veteran Indian Country Today reporter of Mohawk and German-Austrian descent — recognized some clues in the photo. The headdress and style of clothing indicated Lakota from the Great Plains region of the U.S., he said — possibly somewhere near Porcupine, S.D. He emailed Markus Lindner, the exhibit's curator, to get a copy of the full poster to see if it had any more clues. Just a few hours before he was scheduled to appear on NPR's Weekend Edition to do an interview about the importance of attaching names to faces in Indigenous history, he got a reply back from Lindner with an image of the poster. It was for a traditional sun dance in — you guessed it — Porcupine, S.D., organized by the Bicentennial Program and narrated by an elder named Noble Red Man. It also featured the words: "For Further Information: Contact Birgil Kills Straight." That name immediately rang a bell for Schilling. "It just so happens, literally about two or three weeks ago, I wrote a story on him having passed away," Schilling said. Kills Straight was a widely known and well-respected elder, and Indian Country Today had published several stories about him — including one by David Archambault Sr., who knew him personally. So Schilling gave Archambault a call. "I said, 'Mr. Archambault, do you know who this is?' He says, 'Yes, matter of fact, I do know who this is.' I said, 'Really?'" Schilling said. "He said, 'Yes, it is Frank Fools Crow.' And I said, 'Well, what do you know? I figured it out.'" Who is Frank Fools Crow? 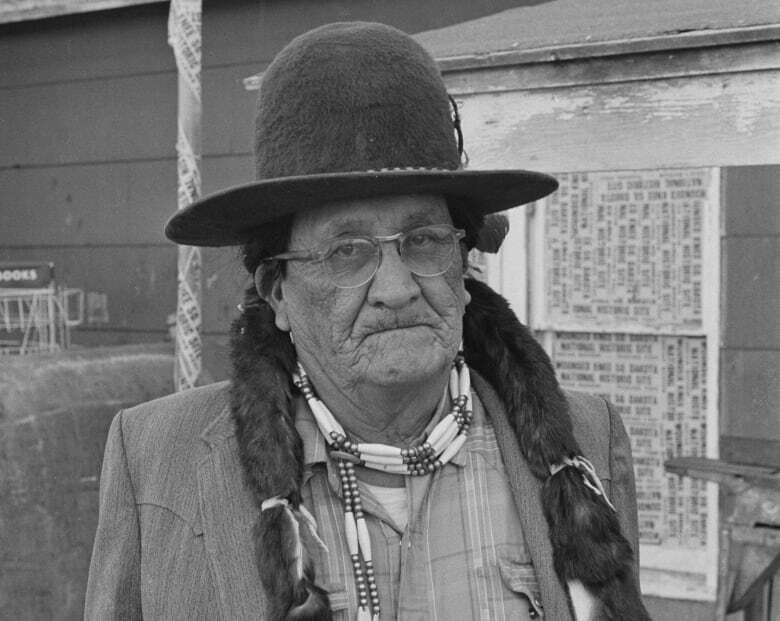 Fools Crow was an "extremely respected" Oglala Lakota elder who practiced medicine and was beloved by his community, Schilling said. According to his 1989 obituary in the New York Times, he helped negotiate an end to the 68-day 1973 standoff in Wounded Knee, S.D., between the American Indian Movement and the FBI. 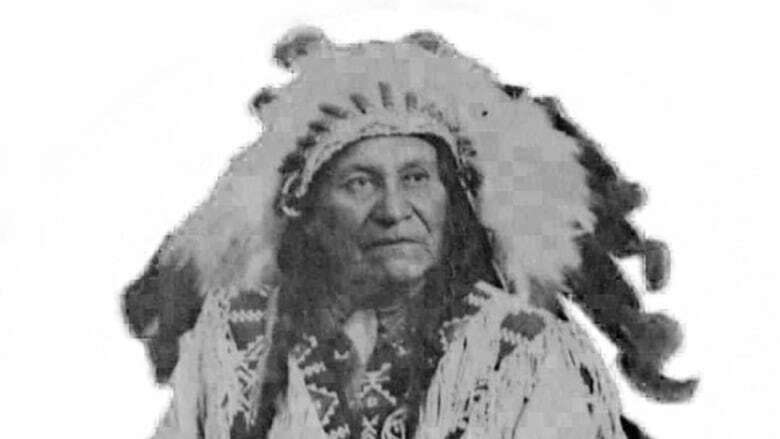 Noble Red Man was another respected elder from the area, Schilling said, and the pair were reportedly inseparable. "He is on the poster because he was so widely respected and highly regarded in the community," Schilling said. "So it was very interesting to hear some of the things about him." Schilling said he hasn't yet heard back from the museum about his findings. As It Happens has reached out to the exhibit's curator for comment. Schilling credits his successful investigation in part to good old fashioned shoe-leather reporting. "There's a joke that everybody knows everyone in Indian Country, but it is a pretty tight-knit community and I usually can find someone who knows someone, and with enough phone calls or interactions, I can usually come up with something," he said. But he also believes there's more to it than luck and perseverance. "My ancestors, I feel, guide me all the time and I really do felt like I was guided to find the information of Mr. Fools Crow because the connections were very odd," he said. "I just feel like there are connective forces that kind of lead me in the right way. And I really do feel like this happened in this instance." Written by Sheena Goodyear. Interview with Vincent Schilling produced by Kevin Robertson.